I was using my phone to wish some friends a "Happy New Year", when I noticed that the auto-correct changed my text to "Happy New Yeast"! While it certainly wasn't what I originally meant, I just rolled with it. And… in a way, it sort of makes sense when you think about it. Yeast makes things rise or ferment. And what better sentiment than to wish someone a year that will rise to the occasion and bubble over with good tidings! I found this vintage advertisement for Magic Yeast and modified it in Photoshop to read, "Happy New Yeast". 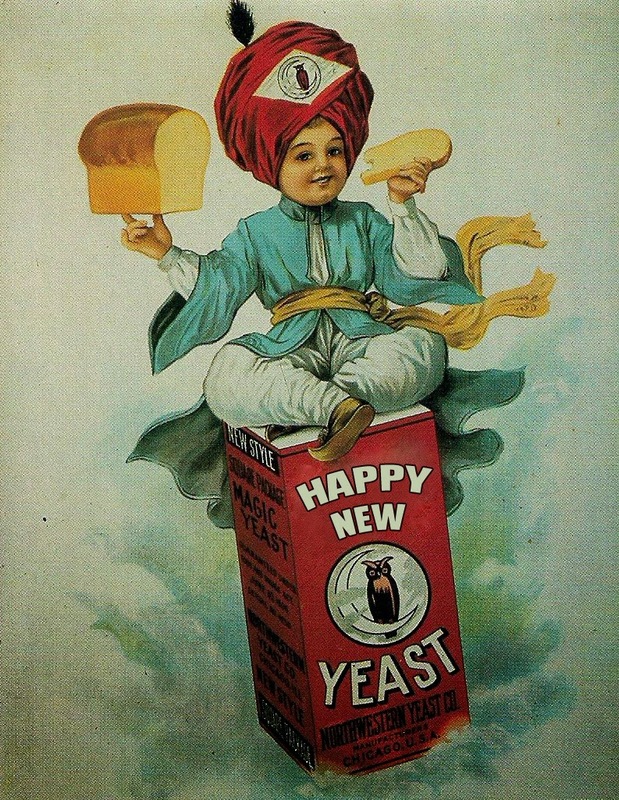 And I do hope you have a very Happy New Yeast… I mean… New Year! Thank you so much for joining me on my journey and allowing me to share yet another year of my life with you. Best and brightest wishes for the year ahead and all those that follow it! Wonderful news! I just found out that our donation to CARE to help with the disaster relief effort in the Philippines was matched! That means that we raised over $3,000! We want to thank everyone who participated in the fundraising efforts! Thank you to everyone who purchased a raffle ticket, donated a prize, bought a destash item, made a purchase at Allegory Gallery, and everyone who got involved with the Artists for Disaster Relief Silent Auction Blog hop! Thank you to everyone who shared the message and raised awareness. We so very much appreciate all the help and know that the money we raised will be put to good use! Thanks again! A few weeks ago, I mentioned that I was thinking about doing the challenge kits again. People seem to really enjoy them and it seems like I get requests to start them up again every week! When I decided to stop offering the kits and organizing the challenges, we had just opened the shop and I was overwhelmed with the sheer magnitude of everything. Now that we have been open for a few years, things have gotten a little more predictable and I have extra help. What this means is that I have a little bit more free mental space and get back to things like organizing big blog hops. If you're not familiar with the challenges, I put together a kit based on a particular theme. 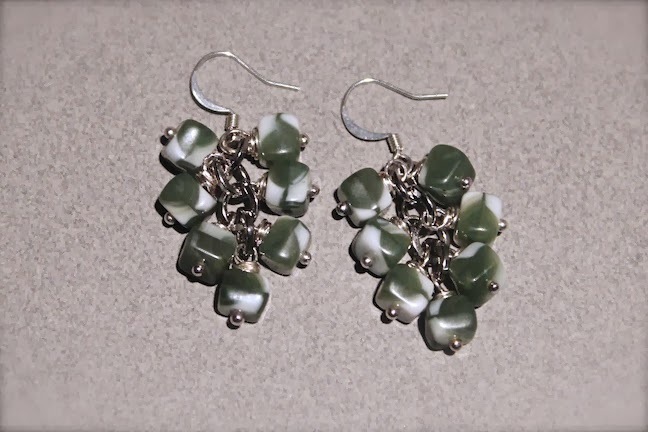 The kits are available for purchase in the online shop and participants are asked to use as little or as much of the kit as they want to create a piece of jewelry. The kits are $20, plus $3 shipping (to most places). Think of it as Project Runway for jewelry (except no one gets kicked off the show)! Once everyone makes something, they can then share it in a Reveal. It's super easy to play along and it really gets the creative juices flowing. Not only that, but I use all my powers to source really cool components for the kits to make them ultra luxurious. Often times, people can make several pieces from the kits and have plenty of extra to add to their bead stashes! I had an idea and started gathering the materials. I gave only one hint at the time what the theme might be. The hint was: 2014! The above picture is sneak peak of the luxury bead blend. Can you guess what the theme is? The kits will go online on Friday, January 3rd at 7PM EST. If you would like to participate, make sure you check back here and/or the online store and DO NOT delay! The kits used to sell out in minutes! 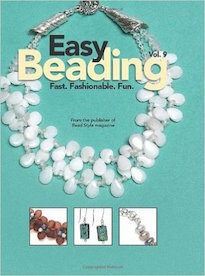 Good luck and happy beading! I can't wait to see what you make! Is it over or just beginning? 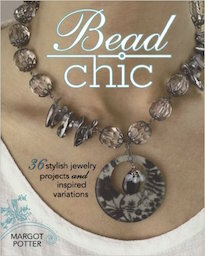 Lisa is asking the same question and sharing her bead selections for a New Year's Eve project! Charlene experiments with resin and vintage rhinestone components and shares her results! Cue the flashback optical illusions! Jean goes from the first piece of jewelry she made in 2013 to the final piece of the year, and explains why they were create and for whom! Sure, Christmas is over… but you'll still want to make these super easy ornaments! 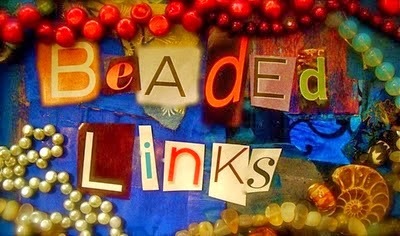 Andrew just returned from filming an episode of the PBS show, "Beads, Baubles and Jewels". Check out his thoughts about the journey. The Crafty Princess Diaries has a big announcement posted about what is happening in 2014. Does last year's wreath or an inexpensive one you bought need a bit more pizazz? Let's kick it up a notch. 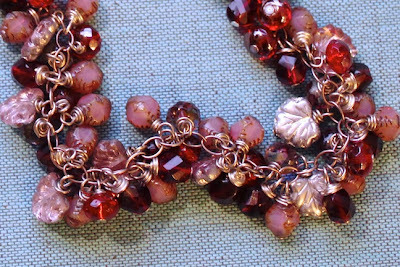 I have been working on creating samples for the seed beads that we carry at Allegory Gallery. It'll be nice to give folks some ideas of how they can be used and allow them to not only see them, but feel them as well. When I'm designing, I think it's a perk to be able to "experience" the beads in an actual piece that can be picked up and test-driven. We just added magatamas to our selection. I really love the shape and how they give pieces a dimensional quality. 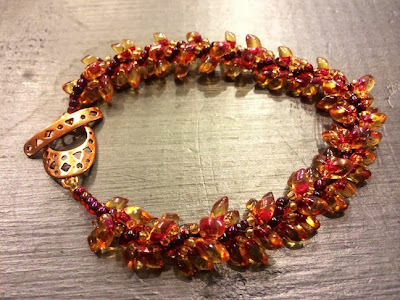 I call this bracelet, "The Fire Dancer". 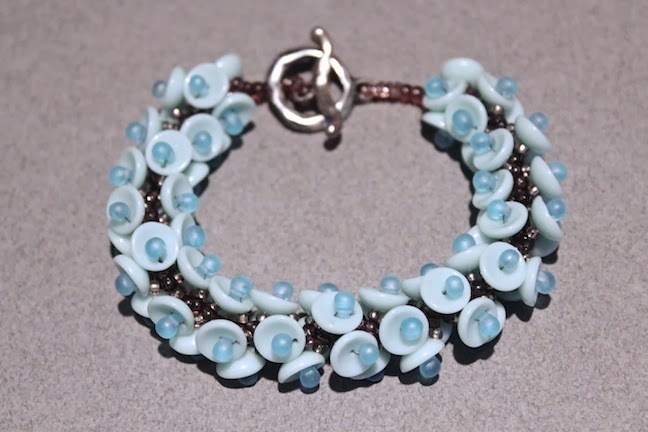 It is constructed with spiral stitch and showcases the magatama beads. The color palette and shape of the beads mimic flames and have a playful movement when worn. The design is fairly easy to master. The one thing I would suggest is to be careful not to loop your thread on the beads of the previous rows. 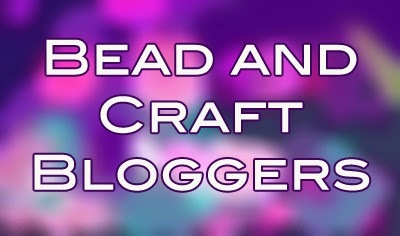 The beads have a tendency to stick out and it's easy to catch the thread on them. In the summer, when I look out on the trees, I am always taken aback by the wide expanse of green. It's a wall of green that seems solid. It's easy to forget that each pixel of color is a leaf with a stem on a tree. It is easy to forget the branches and the twigs and the roots that dig into the earth. 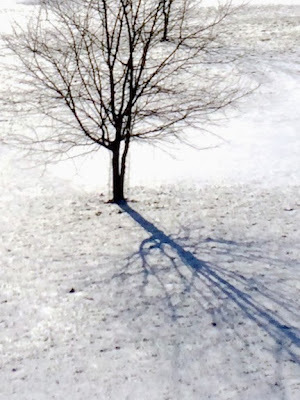 But in the winter, when the leaves have long since let go and fallen to the ground and the snow covers everything, it is hard to ignore the tracery of black lines against the cold white. On bright, clear mornings, the trees cast shadows that double and lengthen the lines in the snow. We have had a quiet holiday season – no parties or festivities. It is a stark contrast to prior years. One might think that something was wrong or out of place, but it isn't like that. It just feels like a time for quiet contemplation. I was talking with a friend the other day and I told her that I felt as though there was a strong feeling that change was in the air. I couldn't pinpoint exactly what was going to change, just that something major was going to happen. It feels as though over the last few months… years… I have been setting down roots. And now that I have done that… it's time to stretch my branches and reach higher. But before the spring comes with new growth, there has to be a time to slow down and examine the lines in the snow… a map of where things are meant to go. When we were kids, we had a cardboard box that served as our treasure chest. To the unsuspecting passerby, the collection within might not seem like much. In fact, to the untrained eye, it might have just looked like a box full of junk. BUT… it was more than just bits of broken glass, old pill bottles filled with plastic beads, scratched up plastic prisms acquired at the flea market and rocks from the driveway (that I smashed in half with the hammer with a brown plastic handle). The box contained our imagination and fantasies of a better life. The box contained childhood touchstones that were imbued with magic and all our many daydreams. Needless to say, finding "Stones of Power" was a core mission essential to my childhood. If they could not be located in the wilderness of our yard or procured from a yard sale or flea market stall, we set about making them. We were alchemists! I thought about that when I was making these. I got a taste for stone-carving when I was visiting Cynthia once. She used to disappear down to the basement and come back up with a handful of stones unlike anything I had ever seen before. No two were exactly alike. The facets followed the beauty of the stones and accented the characteristics of the particular gem. She showed me how to use the lap grinder and I filed it away in the vault of "Things to Do Again". I picked up a lap grinder during a sale a few years ago and it has been taking up shelf space and collecting dust. I decided to break it out and give it a whirl. I wanted something that would be extremely satisfying to carve, so I made blobs of polymer clay. I love polymer! It's sturdy, but carves beautifully and relatively easy. Once I faceted my handful of polymer clay "gems", I coated them in layers of iridescent and pearlescent paints. I didn't like the way the solid colors muted the crispness of the lines and geometric planes, so I scrubbed some of the paint off. In hindsight, they look suspiciously like some pieces that friends and colleagues produce. It's funny how I didn't even consciously think about them looking so close until after I made them. Then I had the "uh oh" moment. It's okay though. I wasn't purposefully trying to copy them and these pieces aren't meant for the public to purchase. They are meant to live with me… in my cardboard treasure box. When I was thinking about what I would make for the bridal issue advertisement, I instantly thought of that good luck saying, "Something old, something new, something borrowed, something blue, put a sixpence in her shoe." This is another piece that I made for the ad. It's "something old" and is a necklace that is composed of vintage Japanese glass pearls from the 50's. I was lucky enough to have a couple of necklaces and strands of these pearls, which I took apart and used in this design. I love the vintage Japanese pearls! Instead of just pearly white, these pearls have a weird greenish shimmer. They've also got a warm peach glow to them. As an added bonus, they're all extremely lightweight! So even this piece, which is quite substantial, is light as a feather around the neck. I think that the pearls give this piece a sort of regal look. 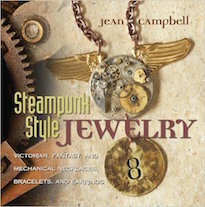 When I was putting it together, I thought of some of the Elizabethan jewelry that I've seen in museums in the past. I suppose it's fitting… isn't every bride, queen for a day? I was asked to create this bracelet for an upcoming advertisement in a magazine's bridal issue. I always feel honored to create wedding jewelry. I get a warm feeling from playing a small part in someone's special day. It's a privilege to make a touchstone to someone's happy memories. In this particular bracelet, it is made up of vintage glass pearls, freshwater pearls, Swarovski crystals, sterling silver balled headpins, antiqued chain, and a vintage-style toggle. 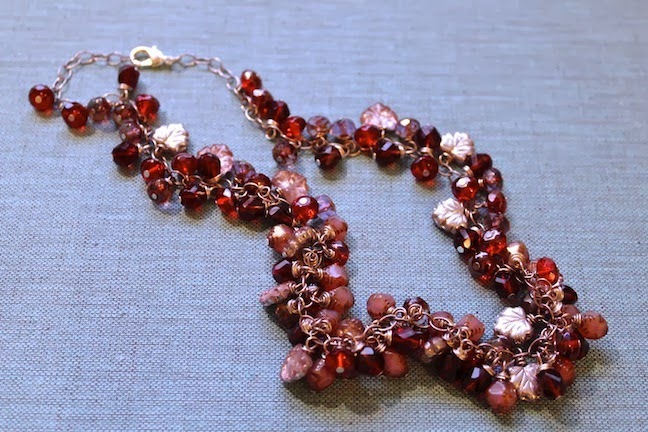 I embellished the length of chain with wire-wrapped headpins. I wanted the bracelet to have a classy and opulent feel. The patinated metal and gold-toned pearls also give the piece a vintage vibe. It has a lot of movement and I'm quite pleased with the result. After traveling the country and talking to thousands of people, it's hard for me to imagine myself as an awkward preteen who was afraid of public speaking. I always felt ugly. My head was too big. My teeth weren't straight. My nose was too round. I had acne and was unfashionable. When I watched TV, there was no one that looked like me… especially not the leading heartthrob. I always felt gangly and out of place. For years, I gave my power to others. I gauged my self-worth through the appraising eyes of everyone else but myself and I hid my potential, so that I wouldn't stand out and get attention. I thought it was safer to be in the shadows. I was convinced that I would be some unloved thing for the rest of my life. Until… I made a decision. I decided that it was time for a change and that I was going to take control. Only I knew my own self worth. No one else. No one else could make me feel less than or not enough. I would not be some unloved thing, because I had the power to love myself. In fairy tales, the hero vanquishes the enemy. They slay the monster and everyone lives happily ever after. In "real life" though, the demons we face don't die… we just outgrow them or learn to live with them. When I talked with Katie about doing the show, I was my self-affirmed self. I was the teacher. I was the salesperson. I was the person who could talk the ear off of almost anyone. But… in the night, that awkward preteen emerged from the shadows. He's sneaky like that. Even though friends and peers told me not worry, I couldn't help it. Even I told myself not to fret too much. But there I was, tossing and turning. As the time grew closer, I became increasingly more agitated. After a stressful, white knuckle drive through the snow and traffic, I made it. I saw my friends and we went out to dinner. It was a lot of fun, but by the end of the night, I found myself shaking. I told myself that it was the cold, but I could feel that former self laughing at me. When I finally settled into my hotel room and discovered that some very important things were missing, I made a decision: What will be, will be. 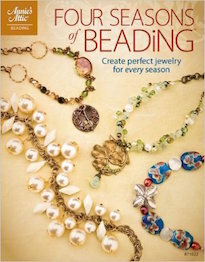 Here's a behind the scenes shot of the Beads, Baubles and Jewels taping. During the course of the preparation for the filming, I joked about my apprehensions, but it wasn't coming from a place of insecurity, but a place of just wanting to do a good job. It also helped that I was surrounded by such wonderful people. It was a true pleasure to be with Candie Cooper, Kristal Wick, Patti Bullard, and Katie Hacker. They were well versed in the ways of TV and were happy to help answer questions or powder my extra shiny face. The staff at KS Productions was also extremely helpful and very easy to work with. I didn't know what to expect, but they were a kind and friendly bunch. As it was happening, I was a little nervous, but the strangest of things… I actually liked it. The format of our segment was very conversationally based and it was easy to chat with Katie and talk about things that were near and dear to me. Of course, in hindsight, I wish that I could have said things a little bit differently and maybe smiled a little more, but the crew said that I did a good job and that we didn't have to do any additional retakes, so… I think it was a success! The whole way back home, I was thinking of ways that I might consider doing more filming. I'd love to be able to share more of the things that I've learned along the way. Maybe a series of short YouTube videos? You never know! Hopefully they'll have me back on Beads, Baubles and Jewels! Despite being a little over a hour away from Pittsburgh, I must admit that we rarely make it in town. There always seems like there is an endless list of things to do at home and in the local community. 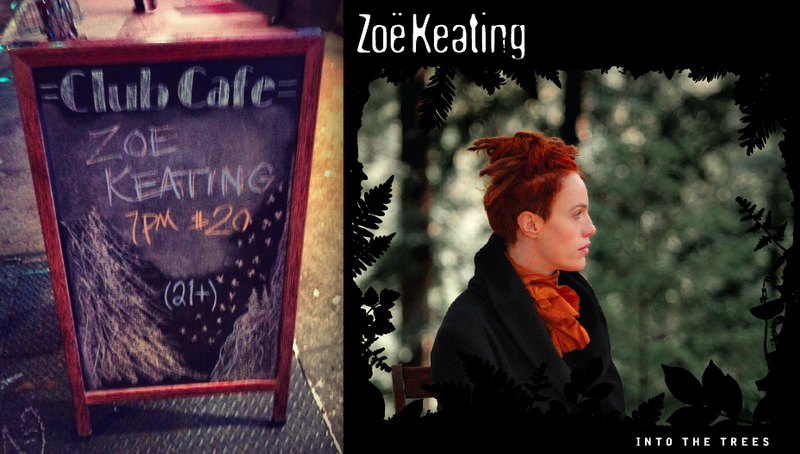 But… Zoë Keating was in town and I knew that if I could make it happen, I definitely wanted to! If you're a fan of the CBS show, Elementary, you might recognize Zoë's work from season one. Her work was featured in the soundtrack, and I think went perfectly with the quirky suspense and mystery of the show. Besides being the soundtrack of a popular television program, at any given time you might stumble into my studio with her music on repeat. I knew her work before the show and used it as my own soundtrack. Her music has such a mythic quality. I love to work to it. She plays the cello and works with layers. It would be easy to imagine her playing with a whole fleet of musicians and an entire orchestra, but she plays solo and has a laptop (that she uses her foot to control) to create those multiple layers that weave together. Her music has such energy and evokes such a powerful emotional response. When she uses her cello to create the percussion tracks, I can literally feel my heart beat faster. It's kind of like running through the woods in some fairy tale. Seeing her perform in person was really a treat. I was familiar with the selections, and it was interesting to see how she builds the music, layer by layer. She really has a focused intensity and does such a wonderful job storytelling with music. It was a lovely distraction and I'm glad that we could brave the elements and make it to town to see her play. The space was packed and very intimate. I was pleased to see the show sold out and filled to capacity. Zoë Keating is highly deserving and I definitely recommend listening to her music. CLICK HERE to visit her website. When I opened the box from Portland-based artist, Junker Jane, I couldn't help but smile. Within the package was a motley crew of misfit art dolls and fabric collages! I loved the playful expressions and it brought back happy, childhood memories of the rag dolls that my grandma made me and my siblings. I delighted in the balance of saccharine sweet and curiously creepy. The exhibit is up on Project Wall 1 at the gallery, but if you can't make it to Allegory Gallery in person, fear not! You can see the show online HERE. You can also purchase pieces from the show online. My sister, Cynthia Thornton, and my friends Bob Burkett, Kate Richbourg, and Jessica Gaston have a new project in the works! Let me introduce you to: Gaston Collective Jewelry. 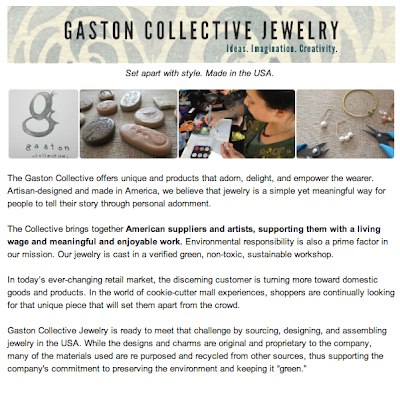 It's a new jewelry line that is produced right here in America! As a company, they are concerned with creating jewelry without harming the environment and strive to repurpose materials and work in a "green" workshop. 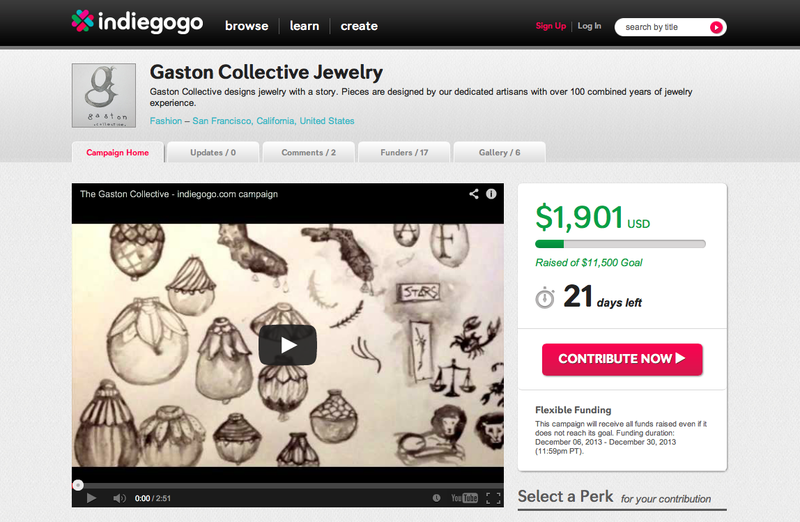 To help get this project rolling, they've started an Indiegogo campaign with lots of really nice perks! CLICK HERE to check out their fundraising efforts! 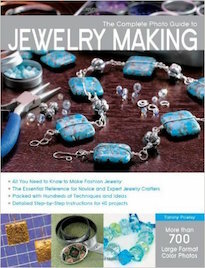 Making holiday jewelry this season? The inspiration for Lisa's latest necklace is pretty obvious! What do you think? A set of quilting-themed rubber stamps create interesting jewels when you stamp them into resin clay! Check out this month's challenge piece – the vibrant Winter Landscape from Wassily Kandinsky. 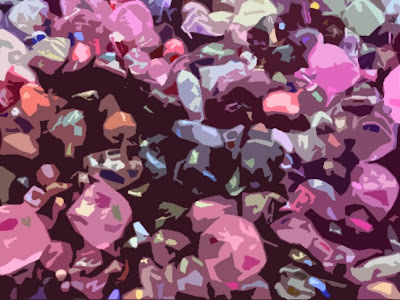 Brandi leads us through rich and saturated hues with her Palette post. 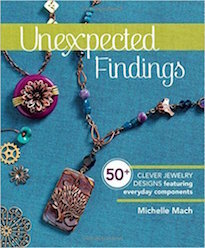 Interested in beautiful jewelry design techniques? 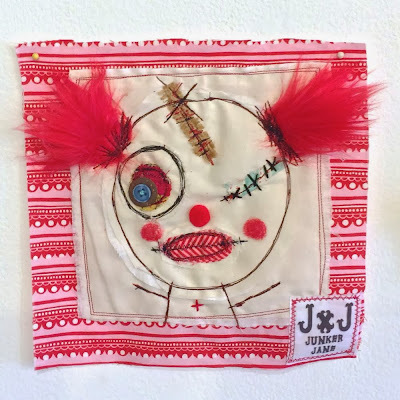 Jean reviews Rebecca Ann Comb's book, "Kumihimo: Basics and Beyond". Do you need some nice looking display items? 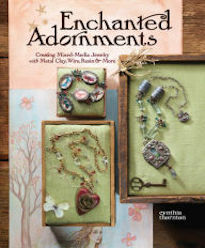 Check out Cyndi's giveaway! If you've been following along, I think one of the biggest questions now is: How much did you raise? With the help of our friends and community, we raised a little over $2,000! 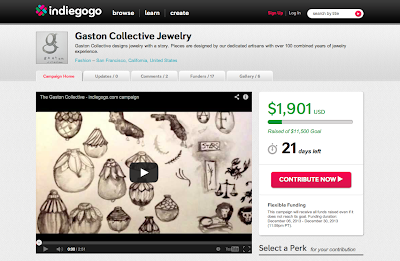 It is pretty amazing to see such a wonderful response to our fundraising campaign. We want to thank everyone involved in the effort! Thank you goes to everyone who donated items, hosted auctions, and donated their time to making this a success! We also want to thank everyone who bid on items, ordered destash treasures, and purchased raffle tickets! We honestly were blown away by the positive response at helping others half a world away. I also wanted to take a moment to thank Sheila Thornton for her drive to make this mission a success! She designed the beautiful banner that has been going around and helped spearhead this plan of action! Thank you, Sheila! We are truly grateful for all the good energy that has been focused towards our project and hope that the money that we have raised will be used in the most constructive and helpful manner possible! The winning bid for my silent auction comes from Margriet Schnabel! Congratulations! I hope you enjoy the necklace! We appreciate your support! I also wanted to take a moment to thank my fellow artists who helped raise money for the disaster relief effort! Thank you so much for taking the time to participate and for being so generous! I cannot tell you how much this means to me. The devastation that was left in the wake of Typhoon Haiyan was terrible; your efforts will help provide the basic survival essentials for so many in need. Thank you! Let's give a big round of applause to Sheila Thornton, Erin Prais-Hintz, Michelle Ann McCarthy, Diane Hawkey, Lynne Suprock, Eva Gibson, Diana Ptaszynski, Lori Greenberg, Sarajo Wentling, Mary K McGraw, and Tara Linda! A special thanks goes out to my partner and co-owner, William Jones, for his tireless working in the background to make sure that everything runs smoothly! We were going to wait until tomorrow to post the winners, but William and I were so excited, that we decided to stay up late and post them tonight! Before we announce the winners, we wanted to thank everyone for their participation. A HUGE thanks goes out to all the many generous patrons who donated items to be raffled off! We also wanted to show gratitude to everyone who got raffle tickets! THANK YOU! We really appreciate your involvement and are so happy that we could help facilitate the relief effort in the Philippines! We will be in contact with the winners to inform them of what they've won and make further arrangements. Thank you again for participating and for being involved in this very worthy cause! I had just come off of a winning streak and snagged top spots in several design competitions, when someone asked me, "What's your secret to winning?" "No one wins everything all the time. Sometimes you win. Sometimes you lose. Depending on what the judges are looking for and their personal aesthetics and the judging criteria, even the most stunning creations might not place. One thing is for certain: If you don't enter, you can't win. So give it a try and cross your fingers!" Here are some pieces that I recently made for a competition. None of them placed. Even though none of them won anything, I'm quite pleased with how they turned out and think that they're just lovely. I had a lot of fun making them and developed some new tricks along the way! 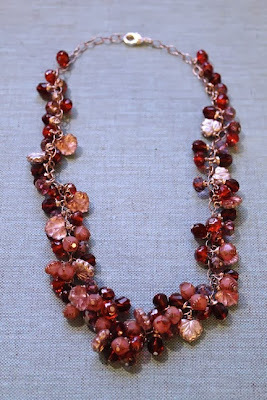 When I made this necklace, it was in height of "leaf-peeking season". I didn't want to do the traditional autumnal color palette, and instead went with shades of garnet, lavender, opalescent rose, and silver. I think the necklace turned out very juicy and I love feel of this piece. I could play with it all day. The technique on this necklace is pretty simple. The chain is embellished with wire-wrapped dangles. The trick of this piece is getting the balance just right. You have to build up the bulk of clusters and then gently gradate outwards. In this piece, I used Czech glass rondelles, maple leaves, and faceted polygon beads. I like how it's both warm and rich, but tempered by the coolness of the silver. It's certainly sparkly, but not over-the-top. I imagine that this piece could be worn to a more formal event or with just a t-shirt and jeans. This piece featured concave "piggy" beads. I incorporated them into this bracelet with a spiral stitch. It took a little figuring to get the bead proportions right, but eventually I came up with a way to get the beads to fit together and create this "studded sea urchin look". Here's a close-up. 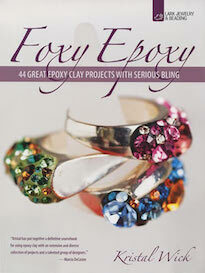 I do like the cool color palette of the blues, amethyst and silver. In hindsight, I wish that I would have flanked the drop beads with tiny galvanized size 15 seed beads to integrate the silver tones more and give it a metallic pop. I think the end result is pretty neat though. It's a little funky and makes good use of the piggy beads. This was my last submission for this competition. I made them for the earring category. I had these cube beads with a retro mix of white and olive green. They aren't crazy complicated, but I think they're pretty fun. Since the design wasn't overly elaborate, I didn't necessarily have super high hopes for them winning anything. But half the battle is showing up to the party! 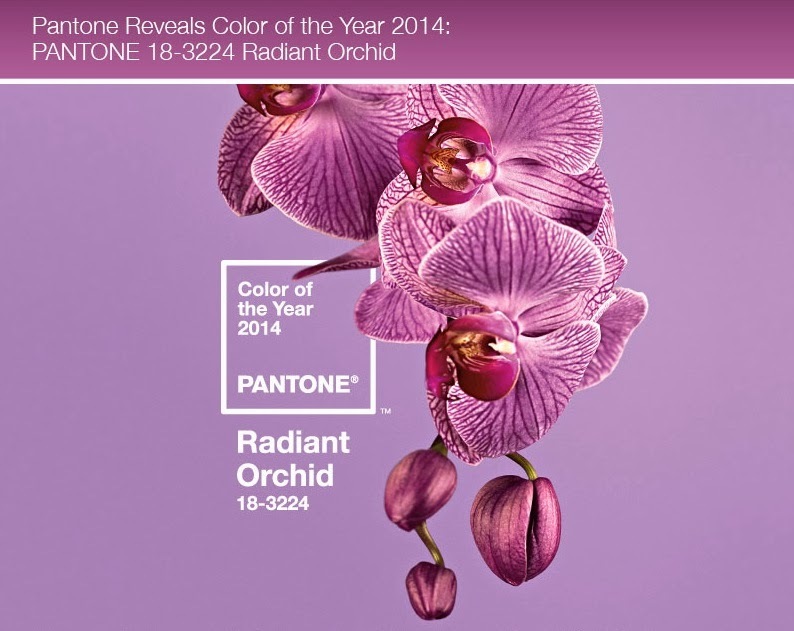 Pantone has just announced the Color of the Year for 2014! Let me introduce you to: Radiant Orchid! I was a big fan of Emerald for 2013 and I was surprised by how much I got into Tangerine Tango for 2012. 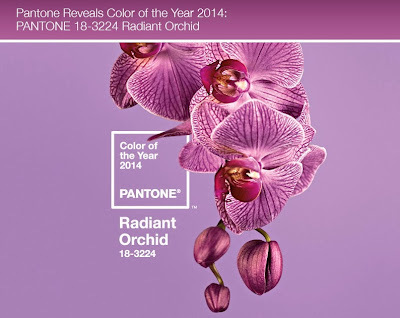 I'm really looking forward to Radiant Orchid. I love the smoothness of this shade of purple. It has a nice tonal gray base that can make this color so versatile. I had to add a name to a list in one of my blog posts. As I was navigating the dashboard, I saw that I was coming up to my 3,000th post. That is this post. It's hard to believe that I have reached this milestone. When I set out to create this blog, just about eight years ago, I really didn't know where it would take me or how much it would impact my life. I never realized how a digital platform would become my constant companion. In this blog, I have tried to do more than just recount my activities or promote my work, but share what it feels like to walk a day in my shoes. I share a side that doesn't always get vocalized, but is very much a part of me. The goal was to create a complete portrait, with highs and lows alike. Over the course of maintaining this blog, I have moved (a couple of times), opened a store, battled cancer, found a partner, acquired two cats, won awards, lost competitions, made friends, lost friends, and reconnected with a long-lost sibling. I have shared what I've had for dinner, where I want to go in the world, and brought together artists who want to make a difference. I have traveled across the country to give insight behind blogging, from the deserts of Tucson to the mountains of North Carolina. I have met thousands of people who have dropped by the blog, some every day. Over the course of 3,000 posts, I have made a lot of jewelry, done a bunch of paintings, and have always had my hand in some crafty project. This blog chronicles the journey of a maker of things. If this blog has taught me anything, it's that you are not alone. If you want to dress up like a zombie and roam the streets like the undead, there are others who are out there who want to do the same. If you want to paint yourself blue, there will be someone willing to hold the brush and make sure you don't bump into any walls. If you have a dream, there are others out there who share that dream and will help to make it a reality. 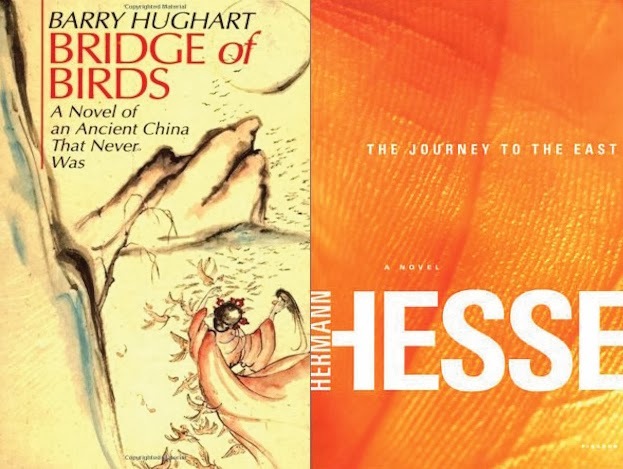 Due to the holidays, there have been some adjustments made to the schedule of events for the Inspired by Reading Book Club. The November meet-up and the blog hop (planned for December 3rd and 4th) have been postponed. We will be combining the meet-ups for "Bridge of Birds" by Barry Hughart and "The Journey to the East" by Herman Hesse. The in-person meet-up at Allegory Gallery is scheduled for January 7th from 6PM to 9PM. The blog hop is scheduled for January 8th. Hopefully this extra time will help and take some of the pressure off participants at this busy time of year! I recently saw a post from a young gay man that was HIV positive. He wrote a post about how he did not define his life by his HIV status. I smiled to myself. If you pushed "rewind" on the clock ten years, twenty years, thirty years... that statement would have been boldly audacious. Because being HIV+ was a death sentence for so many. Not only did it condemn people (both straight and gay) to die, but it carried with it marring social stigmas. Who can forget Ryan White's story, who was kicked out of middle school after having contracted HIV through a blood transfusion? He was fiercely discriminated against. Seeing someone who was living their life nowadays, without that baggage was nice. It was good to see a shift in social consciousness and that with a little bit of time, research, and treatment, something that was so terrible on a pandemic scale could be managed and that infected individuals could lead their lives without worrying about being so openly and freely hated. The smile was a bittersweet one though. 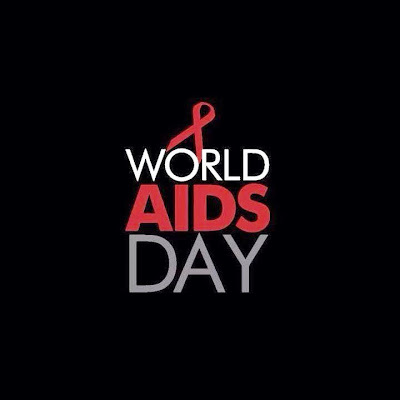 While there certainly have been improvements made across the board in many developed countries in the fight against AIDS and the prevention of spreading HIV, there is still no cure and other countries... other continents... who are less fortunate, still suffer to this day. Infection rates in Africa are ridiculously high, even after attention has been brought to this issue and treatment has gone up in recent years. HIV/AIDS is still a major health concern that effects gays and straights alike. It is not just something that effects those who have contracted the virus, but impacts the lives of people who are HIV negative as well. Today is World AIDS Day. To find out more about what this means and how you can participate, CLICK HERE. I am HIV- and I use this day of observance to reflect on those who I have known who have lost their lives to this disease and to hopefully bring awareness to it. The fight isn't over yet. Until there is a cure and it is accessible to everyone who is infected, the fight isn't over yet.